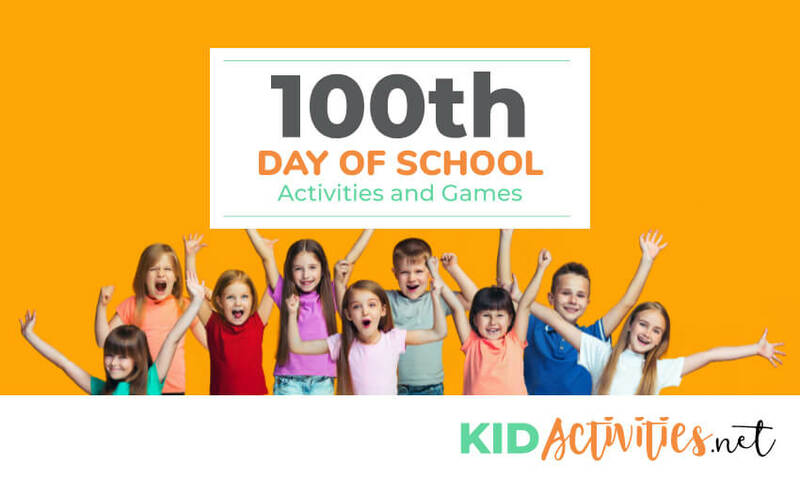 Looking to celebrate the 100th day of school? Here is a collection of 100th day of school activities and ideas. 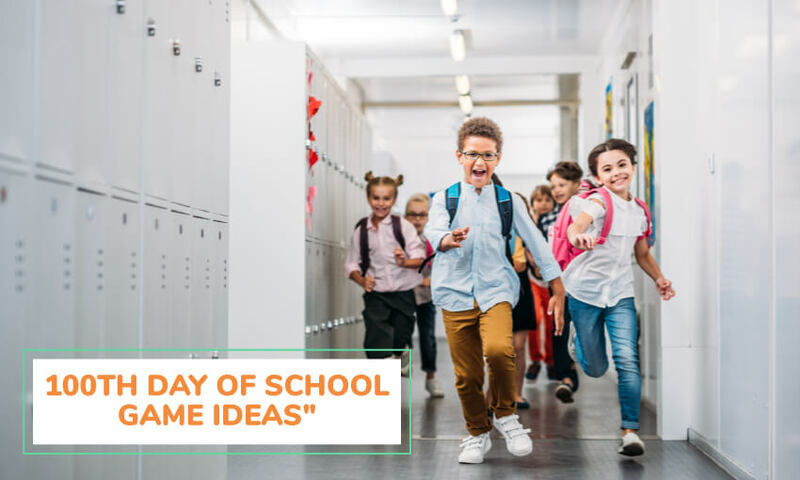 As you look through these ideas, you’ll see great variety that work both in classrooms, schools, AND Before and After School Programs! Ideas for all ages! 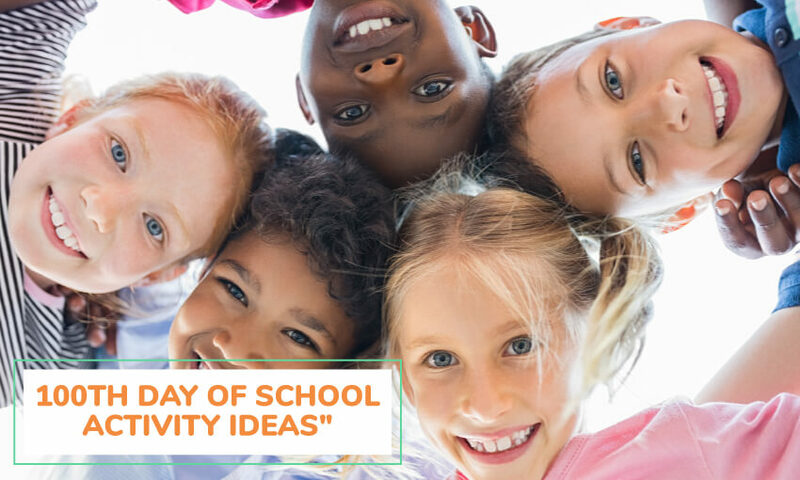 There are ideas that incorporate physical activity, community service, kindness, snacks, art and more…Many are just plain fun any time!!! (Be sure to look at #35 and the one with jewelry! Consider these waaaaaay before the 100th day-Some will take thought and preparation! It will however, be well worth it! Have children make a collection of 100 items and display them on a poster board. Make up your own trail mix using 100 items of each ingredient. 3. Say “Hello” in 100 languages. #1: After exercising 100 times, (10 jumping jacks + 10 times touching toes, etc. ), take out a stop watch and have 100 seconds of silence. Enjoy that 100 seconds! 6. See what you can make with 100 Legos. If it’s near Valentine’s Day, make 100 Valentine cards for local nursing home residents. With a friend- trace each others’ feet. Each child colors and decorates one foot; do this with each child in the classroom/program. Do both feet if necessary. Combine all decorated traced feet and tape the footprints down the hall. 9. How many times can students write their name in 100 seconds? Predict, and then actually do it. 10. Snack – Use one pretzel and two oval crackers to make the numeral “100”. Using an oval template a little smaller than the cracker, cut two pieces of cheese to go on the crackers. 12. Predict how far 100 steps will take you? How many to the gym? To the playground? 13. This one combines…Puzzle Fun, Prizes and Community Service all in one! Break the children into groups and put together 100 piece puzzles. Consider using some of them as prizes– or take a few to an Assisted Living Home when the puzzles are completed. 14. Good Idea for a ‘Graffiti Wall’! On the 100th day of school put together a list of 100 things in which staff and youth are thankful. Encourage kids to be creative and thoughtful as they come up with their ideas. The word “things” does not necessarily mean material items. Leave up the wall for the week. This can be started BEFORE the 100th Day. As a group, decide on a “set item” such as hearts for Valentine Day– or some other object that correlates with your current theme. Each child would make items to get to the “100” number to hang in the room. Attach the 100 objects to various lengths of yarn and hang in the room. 16. Try to get painter’s caps donated from a local lumber yard. Decorate the hat with 100 things. You can use 100 dots, stripes, ribbons, macaroni, popcorn kernels, cereal, buttons, or stickers! 17. Make a poster for your hallway that has 100 painted handprints. This heart shape would be nice. 18. In one program, children popped 100 balloons in the gym while they were timed to see how long it would take. (A middle school program was enlisted to help blow up the 100 balloons–A nice Community Service) The kindergarteners loved it. It really got the children” pumped” for the special day! Have children work with a partner (pair up a child that is struggling with someone who is good with numbers). Each child has a different colored marker, and they alternate writing the numbers. (For example 1 is red, 2 is blue, 3 is red, 4 is blue…..on and on to 100). The kids will love to do this; it’s amazing how much they teach each other!! 20. Do you have an After-School Program? Hold a school wide contest entitled “Guess which jar has 100 pieces of candy”. Each student in the school is given a ballot prior to coming into the program or area. • They first view your children’s 100th day projects and then guess which jar has the 100 pieces in it. • To add on to this idea— the visiting children go out into the hallway and walk the 100 footsteps that are laminated on a roll of paper and taped down to the hallway floor. • Near the end of the day, the winning jar # of candy is announced, and one piece of candy is distributed to each winner…Or if there is one winner, they can share the candy with their class! Their name and room # are on the ballots. 22. Take an indoor parachute and popcorn 100 pair of rolled up socks… (Start getting old sock donations early!) Or put 100 one dollar play money bills in the parachute. 23. Read the book 100 Hungry Ants. 24. Before the 100th day – have children make posters with each child stamping 10 times on a piece of paper. Do this until you get to 100 stampings on each poster. Write “Happy 100th Day!” and post them around your area. Who can count backwards from 100 the fastest? Who can jump 100 jumping jacks the fastest? Who can jump-rope to 100? 26. A “Penny Harvest”: Each child is asked to bring 100 pennies that they harvest up from the loose change at home. The students estimate how much 100 pennies would weigh. How high they can stack 100 pennies. How many pennies it would take to outline a child. What the grand total amount would be of the pennies. Find your birth year on a penny. When done… donate ALL the pennies the students in the program collected to a local charity. 27. In the USA, the hundredth day usually falls in February— for ‘Black History Month’ put together a bulletin board with the children compiling a list of 100 African-Americans that have made a difference. 28. As each child enters the door on the 100th day, give them a number. 1. All through the morning and afternoon , set a timer to go off every 10 minutes. 2. At that point someone takes a number from a hat – and the child with that number gets a small prize. 3. Every 100th minute, the winner gets two small prizes. Children enjoy the anticipation. 4. Count by tens every time the timer goes off and kept a record on chart paper or whiteboard/blackboard. 5. When outside make sure you have the timer and prize box. 6. Stop after every child has a prize!!! Have children take a prize if they leave for home before their number is chosen. 29. Celebrate the 100th day or week celebration by shaking milk shakes –100 times. Make shakes from softened ice cream, milk and chocolate syrup if desired… put all into a tight containers. Have children count to 100 as they are shaken. Pour into individual glasses and add straws…Kids will love them!!! 30. Give each child in your program— slips of paper that will eventually form a paper chain… The amount of slips of paper each child receives will be based on the number of kids in your program. (If you have many children consider doing 200 or 300) Have each child write different things they enjoyed most in your program or class to this point. (One experience to one paper loop) Connect the 100 fun things together and hang it as a paper chain. 31. During “100th Day” week put up a large sheet of butcher paper; you can also use a black board/white board with the title “100 HAPPY Words”. Words make the world go around and words that are “Happy” do affect the environment of your program! 33. Tie the hundredth day with ‘Acts of Kindness’. Make a tree out of poster board & add leaves using green, yellow, & orange construction paper. On each leaf write good deeds done by the children. Keep adding to the tree until it is blooming with 100 acts of kindness. The book The Giving Tree by Shel Silverstein would work with this activity. 34. This idea is great for Pre-k and/or a Kindergarten program. Read the Wolf’s Chicken Stew…and then take the children AWAY from your room. Have someone hide 100 paper chickens cutouts around the room. Have chickens sticking out of books, in the play bins, in children’s boots, under the tables and up/down/in/out of everything…! When children return have them find the chickens and group the chickens in lines or piles of 10’s. Keep searching until children just don’t find any more! It’ll be a nice surprise when a few chickens are found over the next week or so. 35. All 100th Dayed out??? (Great Idea!) CELEBRATE THE 101st DAY OF SCHOOL with a Dalmatian theme and watching the movie “101 Dalmatians”! 36. Have kids complete this sentence: I wish I had 100 _________because ____________. 37. Have students collect 100 cans of food, and donate them to a local soup kitchen. 39. With your group send a postcard to a school in some or all of the cities 100 miles away from your school. 40. Have students compare the time it takes to melt 100 ice cubes at several different air temperatures — inside, outside, next to a heater, next to a fan — and show the results in a chart or graph. 41. Have students make a list of 100 things that didn’t exist 100 years ago. 42. Help your students make a classroom quilt with 100 squares in it. 43. Together with students’ families, create a cookbook of 100 favorite recipes. 44. Without looking at a calendar—ask children to estimate what the date will be in 100 days and to check their estimates on a calendar. 45. Help your students list 100 flavors of ice cream, and have them vote for their favorites. Show the results in a chart. 46. Ask kids to write a list of 100 opposites. 47. 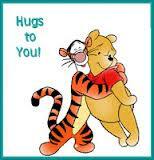 Help children send 100 cards to a local nursing home. 48. Challenge students to perform 100 acts of kindness. 49. Have kids make a chain of 100 paper links and measure how long it is. 51. Invite someone 100 years old to visit your program/classroom. 52. Have kids write their names using 100 paper dots. 54. Have a beanbag toss. Who can score 100 first? 55. Challenge your group to read 100 books. 56. Geography: Look at a map to find what is 100 miles north, south, east, and west of your school. 57. What was happening 100 years ago: Who was President? What were some new inventions? 58. String necklaces with 100 beads or Cheerios. 59. Calculate what year it will be when you turn 100 years old? 60. Write a story about what the world will be like in 100 years. 61. Are there buildings taller than 100 stories? Find out. 62. Sing “100 Bottles of Pop on the Wall” all the way through! 63. Learn 100 new words. 64. Build the tallest structure you can, using tape and 100 craft sticks or straws. 65. Count and glue 100 beans or seeds to a piece of cardboard. 66. Count by 2’s to 100. Then, count by 5’s. 67. What would you do with $100? 68. Close your eyes for 100 seconds. Stand when you think the time is up….Have someone time you). 69. What will happen 100 years from now? 71. Walk 100 yards with the entire group. 73. Toss a coin 100 times and graph the results… head and tails. 74. Have children draw a picture of how they will look when they are 100 years old (These can be hysterical!) They can also write about the picture. What will they be doing? Their families? What will the world be like! Etc. Measure out 100″ on the floor or field. Mark a start and finish line with the tape. Start the race at the signal and try to reach the finish line. What makes this difficult is that the children are to move their feet only one inch at a time by taking baby steps! The winner crosses the finish line first. • She also does a 100 in BALL TOSS. Using the same tape from the “Dash Game in #76 and #77), the first person in each team starts at the same time. After they have taken ten steps and crossed the finish line, they turn around and toss a soft ball. If it is caught, they get to sit down. If not, they go to the back of the line for a second try. •We each get a large piece of art paper & draw 100 of the same item on it. Everyone must do something different. I tell them to think of something simple & something they would like to draw. It usually takes two days. They learn quickly that 100 is alot of things. The posters turn out cute & we display them in the classroom. 84. MAKE SHAKER PUDDING – Pour 2 cups of milk into a jar/container with a lid, add 1 small box of instant pudding mix, and shake 100 times. Have children take turns shaking and counting together as a group!